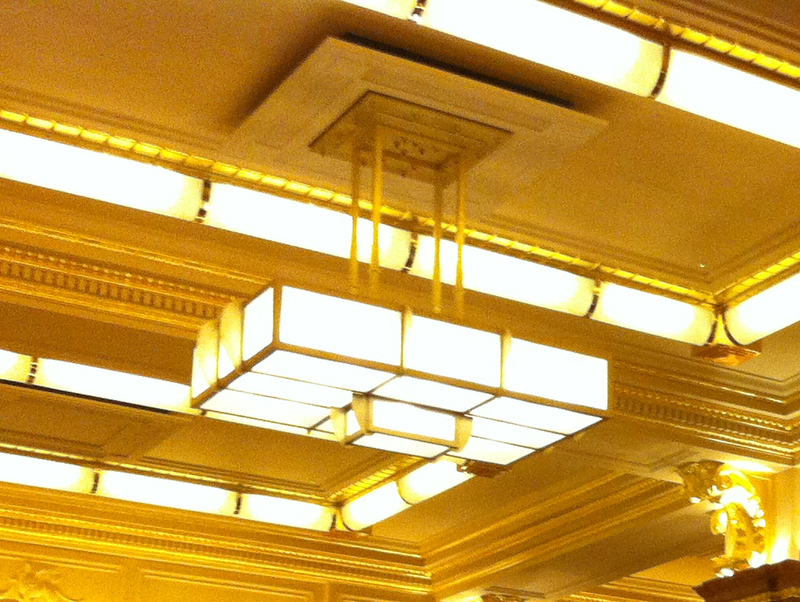 So what does your run of the mill Art Deco enthusiast hang on the walls of their humble abode? Vintage travel posters? A Chinese reproduction canvas of a Tamara de Lempicka painting?.. or perhaps a framed and mounted period advertisement featuring a stylized sketch of a dashing couple enjoying a glass of a trendy French liqueur! All have their place, and yes, like many others we too have examples of all of these gracing our home. Sometimes however, none of these options seem to fit the bill. Sometimes you find yourself with a very big blank wall requiring eye candy and no budget to commission a suitable piece. Its on these very dangerous, and thankfully very rare occasions I go rummaging and dig out my beret, easel and £1.99 set of acrylic paints! The project has been a long time coming. I spotted an image online a couple of years ago while googling The Grosvener School of Modern Art. We’ve got some prints by Cyril Power and i was keen to see more of his work when I stumbled on a random image of some birds in flight. It was by Edward (“Ted”) McKnight Kauffer, “one of Europe’s most prolific and influential advertising poster artists during the twenties and thirties”. The image hit me in the face with a double whammy of admiration and inspiration. Not only was it strikingly original, extremely clever and utterly beautiful, but it looked to my naive eyes that it could easily be copied by an amateur such as myself. I saved the image, logged it on my mental rainy day ‘to do list’ and got on with life. Cue the completion of our new kitchen. 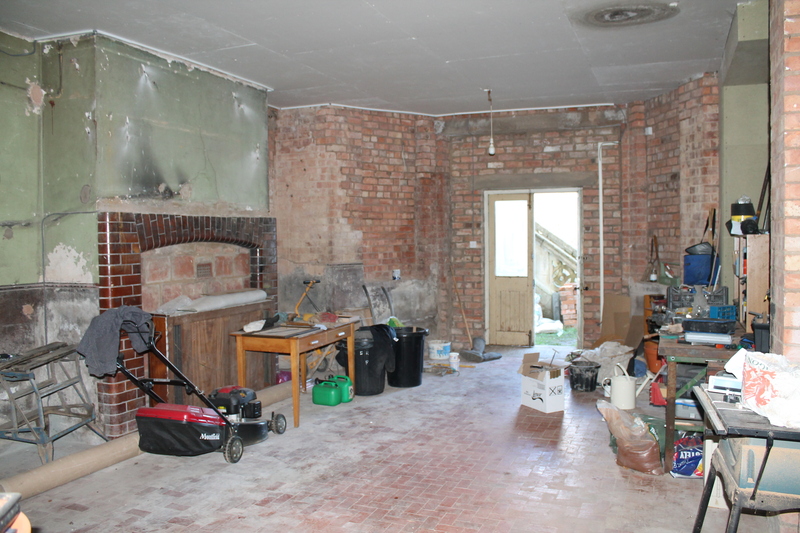 If you look back through some of my previous blogs you’ll see the lengthy transformation of a huge derelict room into our dream modernist food prep and eating area. An area that came complete with one big blank wall! I could stand it no longer, a trip to The Works stationary emporium was made, and coins exchanged for the biggest budget canvas that they had kicking around. Phase one included a long length of wood, a pencil and a jpg. I sketched it by eye, not worrying too much about accuracy. With one eye on the Eurovision song contest (A dreadful guilty pleasure the wife and I always watch!) and one on the canvas I was off. Phase 2 included several rolls of masking tape, hole re-enforcers and some sponge brushes borrowed from my 3 year old. Frankly I underestimated the complicated nature of the intersecting lines and it grew ever more mind numbing trying to work out which bit should be which colour. If it wasn’t for the fear of them showing through I would have turned it into a giant paint-by-numbers! Each stage required the removal of some tape and application of further strips in different areas. The reveal was always a rewarding and exciting moment. Much like on the silver screen with the tense removal of bandages from a beauty queens face after major surgery. Will she look as foxy as she once did? Will the black have leaked under the 50p masking tape ruining the perfectly straight lines? Yes & yes.. she’s still a honey, but nooooo, I knew I should have invested in proper frog tape! It’s not often you get the opportunity to add to your collection with pieces that have a genuine family connection, in fact it’s a first for me. As far as I’m aware, no one in my family has any particular affinity with home furnishings from the 30s and some even consider my fascination somewhat eccentric (dunno what they’re on about!). 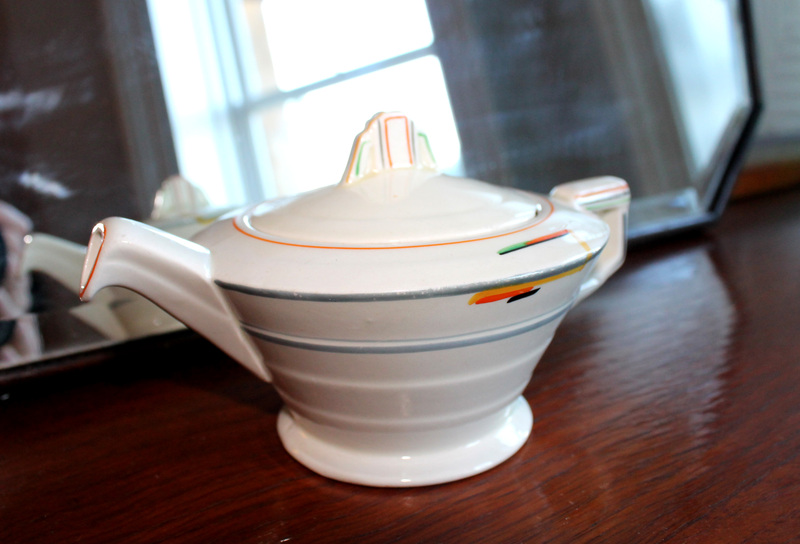 It therefor came as a huge surprise the receive an email from my uncle keen to hand down some pieces my grandparents had acquired new when they married in the 1930s. 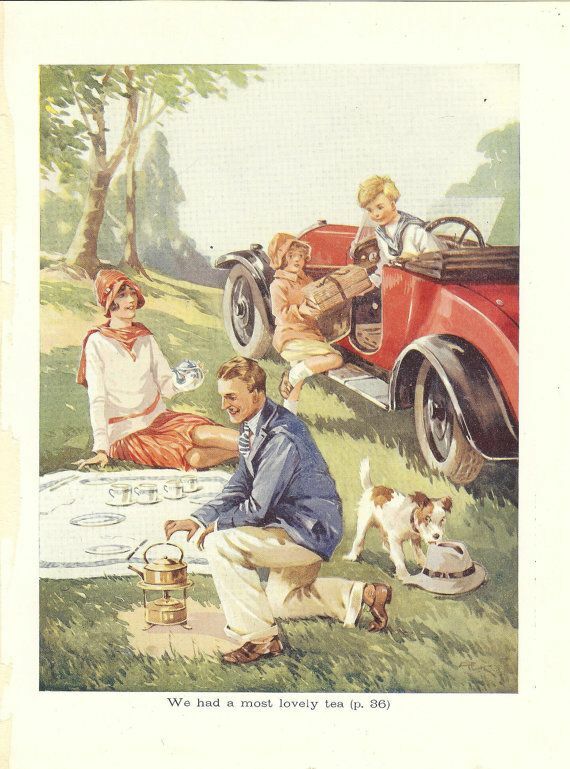 I have fond memories of holidays spent as child staying with them in Devon. A huge garden to run around in and homemade shortbread and lemonade were always in abundance. Sadly they both died in 1990s and after 15 years in family custodianship, their old bungalow is up for sale and in need of emptying. So we’ve just come back from a weekend near Sidmouth sifting for gold. The car was loaded with the usual toddler paraphernalia, so no room to bring back the gorgeous extending ‘magi-cube’ dining table and matching chairs this time. But we’ll head back with a van before completion. 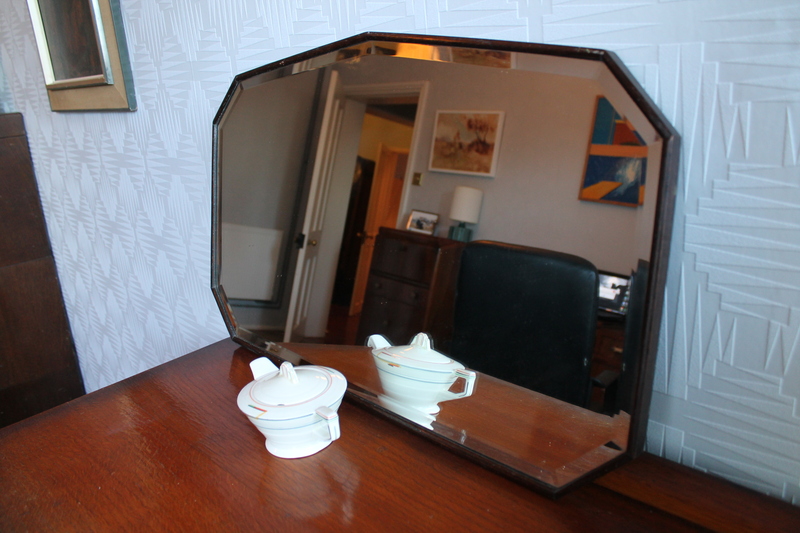 In the mean time I’m the proud new owner of lovely oak mounted frame-less mirror and a Grindley Cream Petal teapot. Now I’m going to spend some quality time hunting through my mums old photo albums looking for snaps in which they feature.